No house ever has perfectly level ceilings and floors, nor perfectly plumb walls. Toss in Houston’s gumbo soil, floods / droughts, and shifting foundations, and you end up with a lot of crooked walls and ceilings. 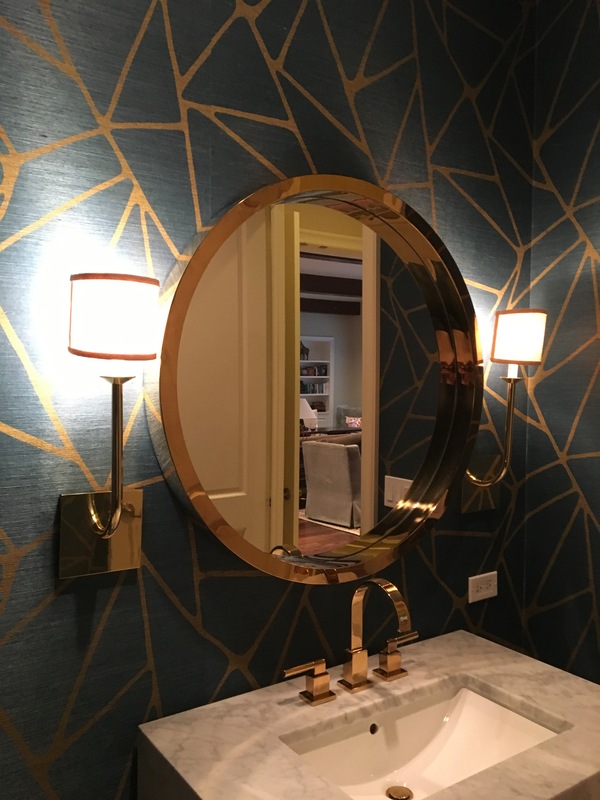 Not a big deal – until you try to hang a rhythmic wallpaper pattern. I would have wanted to put a whole sphere at the top of the wall. But I knew that the crooked ceiling line meant that the balls would start getting chopped off as they marched across the wall, and would lose their tops. 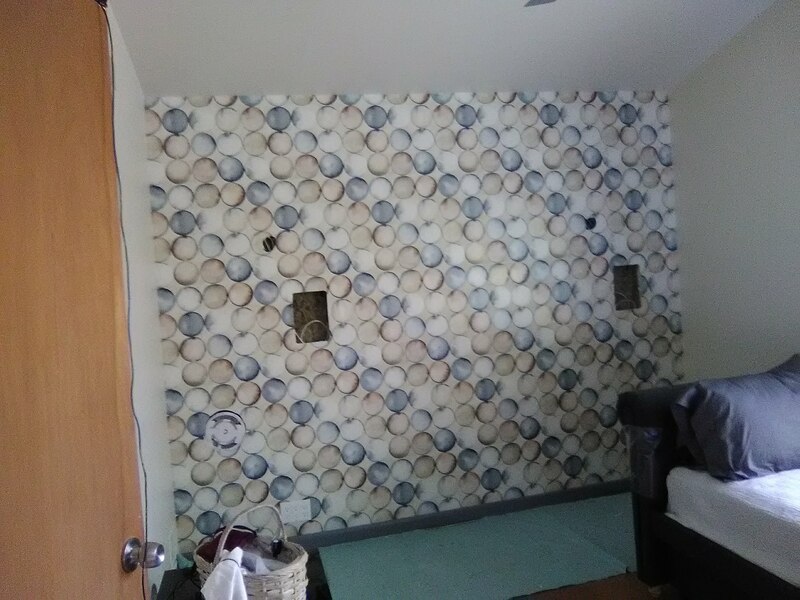 So I placed half-balls at the top of the wall. I drew a horizontal line across the wall, at the point where I wanted the bottom of the top row of spheres to sit. You can see this in the right of the top photo. The tops of the spheres moved up and down the ceiling line, but the bottoms sat smack across this line, all the way across the wall. The half-balls change size as they cross the wall, but your eye notices that much less than they would a fractioned ball. 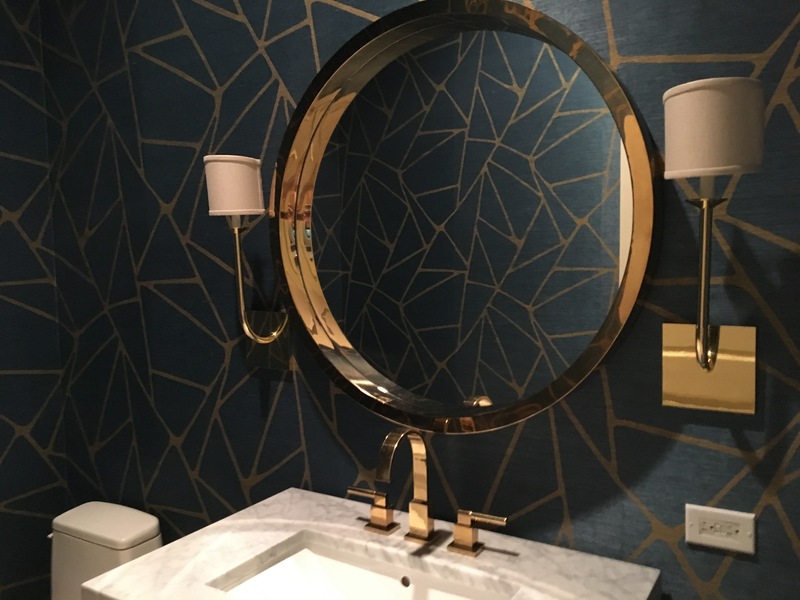 I put this large pattern in a standard-sized powder room. As usual, neither the walls nor the ceiling were perfectly plumb. 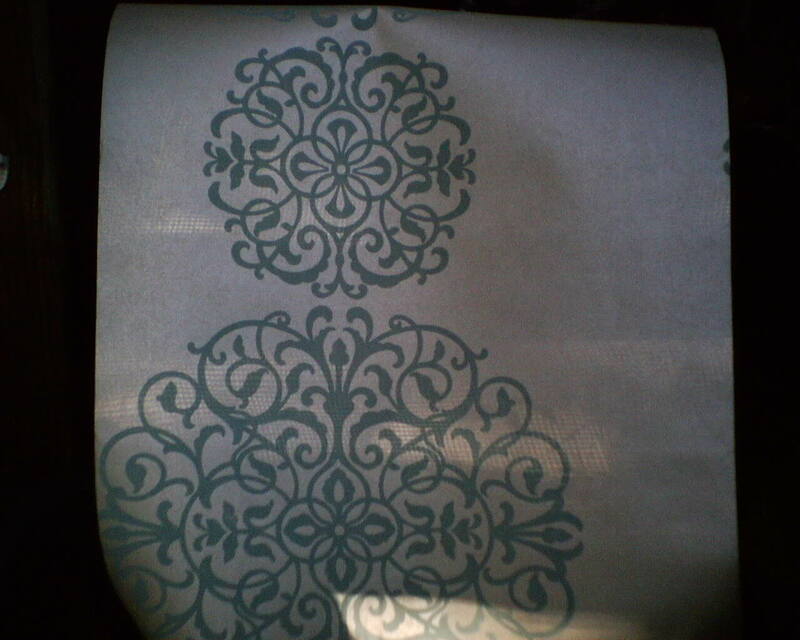 A pattern like this presents a real challenge in trying to keep the paper at least LOOKING like it’s straight. There were minor issues at the ceiling, where the Sheetrock actually took a turn upward for a few feet. But for this post, I want to focus on one of the corners, where there was a much larger discrepency. This was my third and final corner in the room. On the left side of the corner, I had hung a half-width strip, a full-width strip, and then came to the final strip, which also had to be cut to half-width. You must never wrap a full-width strip around a corner – Since walls and corners are never straight, the paper will pull away from the corner in some areas and twist in other areas, leaving a buldge or wrinkle or unstraight edge in the part lying on the new wall. Instead you cut the piece so that 1/16″ wraps around the corner, and then lap the remaining half of the strip over that 16″. 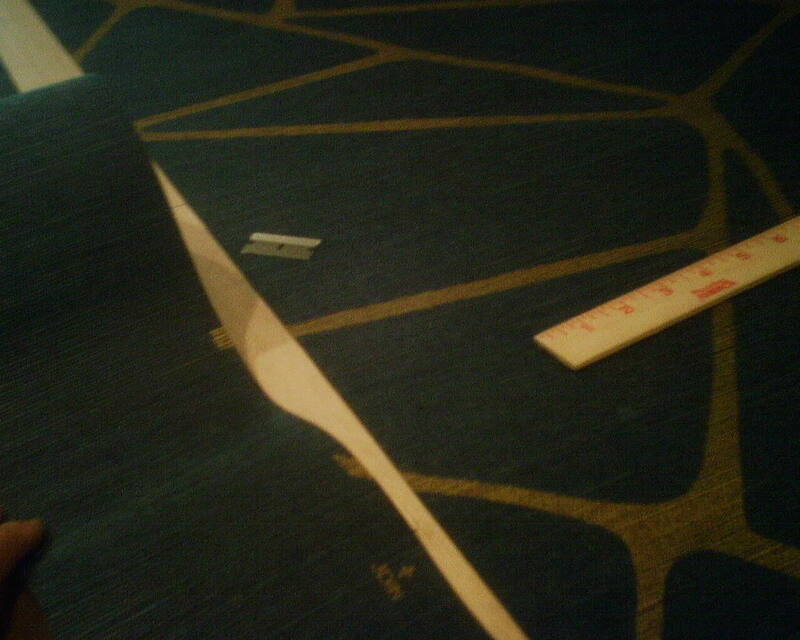 So I took a measurement to see how wide to cut this piece. The only problem is, the top measurement was 10 5/8″, and the bottom measurement was 9 5/8″! It’s not uncommon for the measurement to be a little off. Usually it’s no big deal, because you eye doen’t notice if the pattern is off a little bit. But a one-inch difference over a 9′ drop, on a pattern where the very noticeable lines of the large medallian have to line up reasonably well on both sides of the corner – that would have been very bad looking. On the new wall were to be the remaining half-wide strip, and one full strip, ending at a door. So, only about 30″ of paper – a half medallian, and then a final medallian that got cut off at the right side where it hit the door. If I cut the paper as I normally do, to the fullest width (10 5/8″), it would match nicely at the top, somewhat nicely at the middle, but not so well at the bottom. 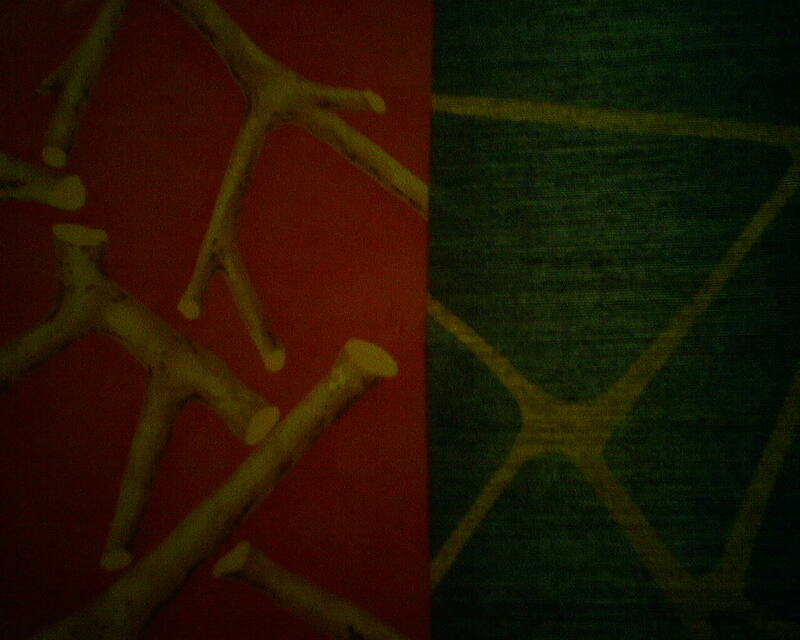 I felt this would be too noticeable, on this particular pattern. So I did something I have only done a few times. I measured very carefully the width of the space at various points from the ceiling to the floor, and cut my piece to match those widths. 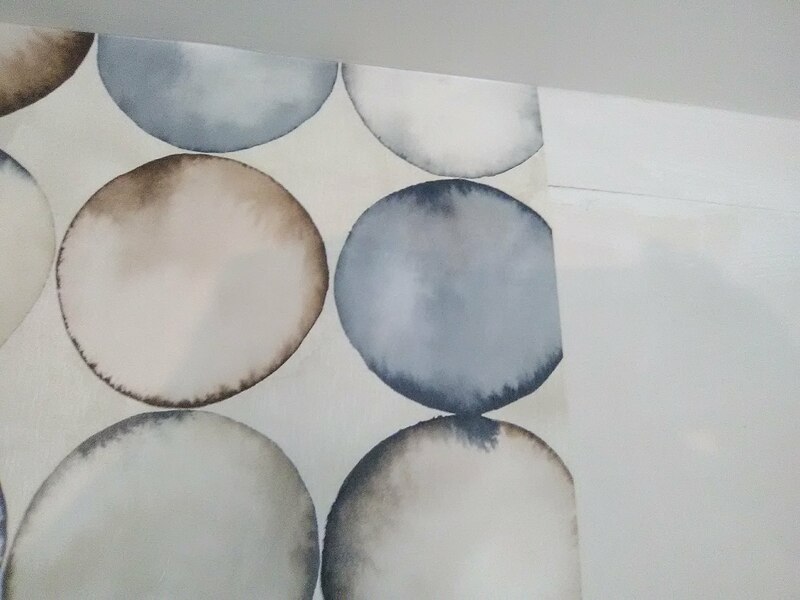 This meant that the paper fit the space nicely and wrapped the corner the correct 1/16″, and when the second half of the strip was applied, the pattern would match perfectly. But it also meant that the next piece, the second half of the piece I had split in two, was also not the same width from top to bottom. This piece was narrower at the top and wider at the bottom. 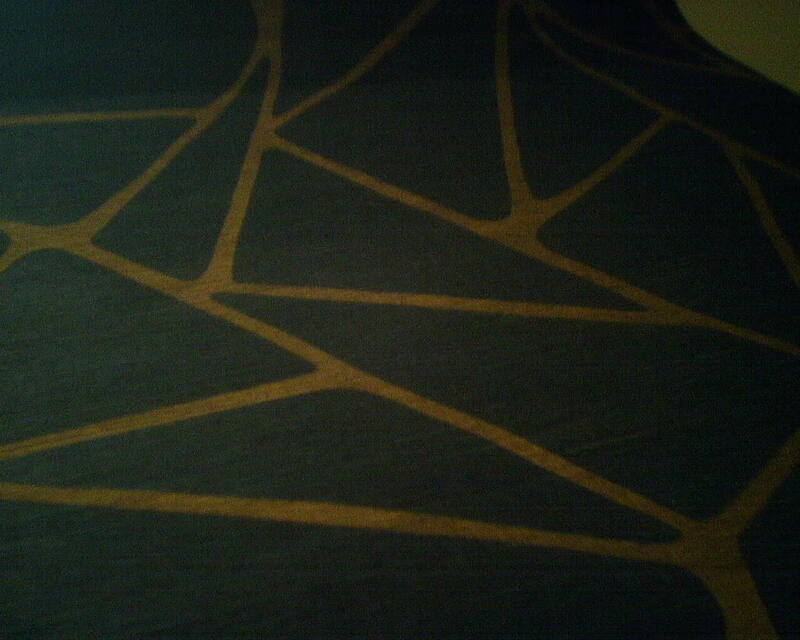 The pattern would match, but the strip would be crooked, and subsequent strips would start angling downward. Besides the medallians not being plumb, they would start dropping from the ceiling line, too. In addition, by the time the second row of medallians hit the door frame, their right side would line up unevenly along the door frame (narrower medallian at the top and a fatter medallilan at the bottom). Trimming a little off the paper from one edge was impossible, because the pattern went to the edge of the paper and would be badly distrupted by trimming off a full 1″ at the bottom. I decided that in this case, since the room was so small and you wouldn’t be able to stand back far enough to see the un-plumb line of medallians, the issue of plumb was not important. Likewise, the issue of the medallians not being the same width as they hit the door was not real important, either, because they were so large, and because they rotated between a large medallian and a small one, so the eye would not readilly catch a difference in width. All that looked good, from corner to door. However, now I was left with one and a half strips over the door. Since the paper was now hanging a little crooked, the paper was going downhill, and, whereas I had plotted to have a full medallian line up right at the ceiling line, now it was going downhill and pulling a little bit of medallian into view, where there should have been none. So what I did was to trim off some off the left side of the first strip over the door, removing less at the top and more at the bottom. This forced the paper to angle back upwards, pushing that unwanted bottom part of the medallian back up above the ceiling line. Also helping was the fact that, by the time I got around to my starting point in my first corner, the ceiling had gone back down to its proper place. 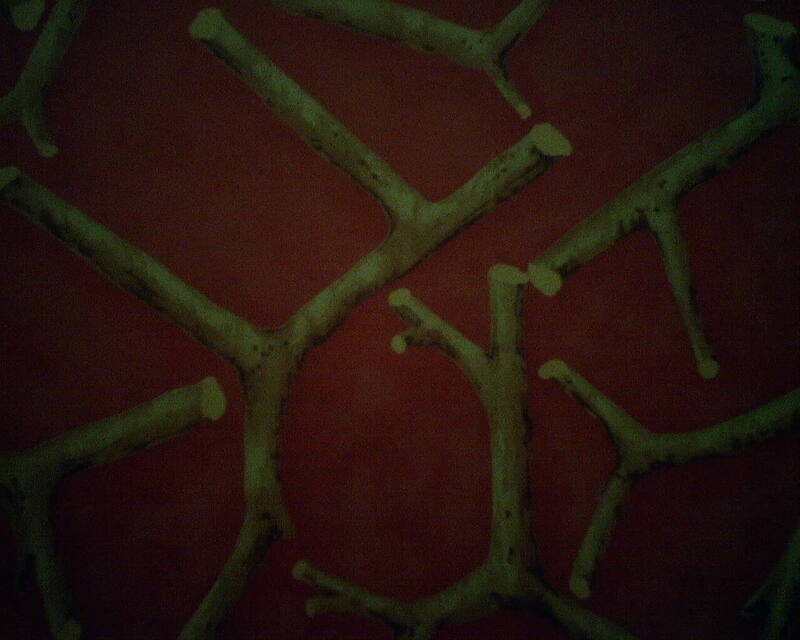 End result, the room looked great, and no one could notice any small discrepencies in the pattern or its match.